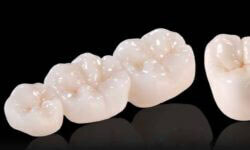 Pure porcelain Emax crowns in Costa Rica are very popular. San José, Costa Rica is a beautiful city and the main destination when having pure porcelain Emax crowns in Costa Rica because of its state-of-the-art dental centers and exceptional board certified dentists. Emax is an all-ceramic system that is based on Lithium disilicate glass, and consists of quartz, lithium dioxide, phosphoroxide, alumina, potassium oxide and trace elements. EMax pure porcelain crows are long lasting, highly aesthetic, and more and more popular. A pure porcelain Emax crowns procedure is $430. It is meticulously done by Costa Rica’s best board certified dentists. The procedure includes the dentist fees and all materials. This is everything you need! No surprises! A pure porcelain Emax crowns procedure can be performed along with any smile makeover procedure. The price is typically discounted lower when having a combination of procedures. If you would like a pure porcelain Emax crowns package with other procedures in Costa Rica, please go here. Pure porcelain Emax crowns prices are up to 80% less in San José, Costa Rica than in the U.S. and Canada. Here are more details. The dentists in San José, Costa Rica are among the very best in the world. They are board-certified and very experienced in the full range of cosmetic dentistry. The airport is the Juan Santamaria International Airport, also known as San Jose International Airport, or SJO. There are many non-stop flights from the U.S., as well as many flights from Canada, Europe, South America and South America. San José, Costa Rica has been a major medical tourism destination for many years, and one of the major reasons is the world-class dentists and low prices for dental work. While here, enjoy tours and sightseeing in beautiful San José, Costa Rica. Your stay will be at the luxury Costa Rica Medical Center Inn where patients recover during dental procedures and where you will enjoy all of the first-class amenities that Costa Rica is famous for.